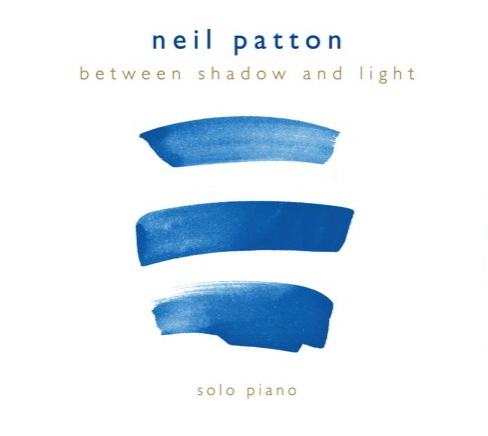 Between Shadow and Light is Neil Patton’s 4th album since his 1998 debut album Horizon and it is obvious that Neil continues to grow as a composer and a musician with each subsequent album that he releases. The new album was recorded on the Yamaha C7 grand piano the same as his 2012 album called Hammer & Wire which probably accounts for the amazing richness of the sound captured on this new release. Between Shadow and Light features 13 original compositions that run for 51 minutes as they gently nudge the listener to contemplate the emotions that naturally rise to the surface of their consciousness and to reflect on life as it was and how it is in the here and now. Neil’s new album is very appropriately named Between Shadow and Light as this is the journey the listener will take with the music as their guide. The path is one that traverses the middle ground of shadow and light dipping into each but never lingering in one or the other because that is the way life is… a mixture of the two. Neil Patton soars with a celebratory zeal on Flights of Angels where his hands dance on the keys of his piano and launches the listener on an energetic passage that makes them feel truly alive as his playing pulls them along to the very end of the track. It is obvious that the music bubbles up from Neil’s very soul as he pours himself into his playing with a happiness that is hard to contain. Even though I really don’t like to pick favorites on the albums that I listen to I would have to make an exception in this case. Flights of Angels is a song that I can listen to over and over again as the music is stirring and is a sparkling composition in which the music dances and swirls around you leaving you feeling happy and at peace with the world. Neil’s beautiful, heartfelt playing is on full display in his song called Walk With Me which stirs the listener with a melody that speaks of love and devotion between those who do not see an end to their relationship whether they are friends or partners or lovers. It is an intimate composition that has a soft emotional texture that is masterfully played by Neil and allows him to communicate deeply with his listeners who will no doubt be touched by this gentle and loving song. The act of walking with someone speaks of a person that is close to you and that you want to spend unhurried time with talking or in silence. It doesn’t matter because being with them is all you need and this song captures that feeling quite well. The album ends with a song called Moonrise that slips back into the shadows for a bit and gives us a cool, silvery kind of song that also shows sparkles of light even amidst the shadows as you might expect if you were outside walking in the moonlight. Even though the moon’s light is dim in comparison to the sun once your eyes adjust to the lower light levels you will be amazed at what you can see. Neil’s playing on this song is a perfect blend that illustrates the theme of the album as he balances himself in the middle ground Between Shadow and Light and offers the listener a little bit of both. As the yin/yang symbol suggests there is a little light in the darkness and a little darkness in the light and that is how it should be. Neil’s latest album manages to musically capture the idea that life is not all light and not all dark but always somewhere in the middle of the two and is as dependent on our reactions to these circumstances as much as the circumstances themselves. Neil’s ability to bring forth these sundry sentiments through his compositions is a testament to his skills behind the keyboard and as a composer. The album’s sound quality is simply stunning as every note played and every nuance that Neil included in his playing was captured with perfect resolution which only adds to the overall beauty of this project. It is apparent that Neil spends the time needed to tweak and to mold his music so that it captures his emotional intent for each of the compositions and clearly shares that with his listeners. Between Shadow and Light is an inspiring and uplifting album that truly shows what is possible on a solo piano release if the person behind the keyboards is dedicated and passionate in what he is doing. Recommend by Ambient Visions.